Bangkok, July 25 — Thailand will remain Asia’s market leader in golf tourism because other countries can’t match the kingdom’s “secret weapon” – the Thai people and especially golf course caddies – according to the largest dedicated inbound golf tourism operator in the region. Mark Siegel, whose company, Golfasian, will this year bring 6000 international golf tourists to south-east Asia, mostly to Thailand, told a group of visiting Asian golf journalists the kingdom would stay ahead of rival golf destinations because of the special way visitors are welcomed. “You can probably find countries with better golf courses, maybe with better value, nicer weather and better infrastructure, but nowhere else matches the genuine friendliness of the Thai people,” he said. The statistics bear out his claim. This year, 600,000 golf tourists are expected to visit Thailand, an increase of more than 15 percent over 2011, making the kingdom the world’s third most popular golf destination after Spain and the United States. This small but important and growing tourism sector is now worth $US2 billion a year in ground arrangements alone. Despite efforts by other regional destinations, including Malaysia, China and Vietnam to capitalise on Thailand’s popularity as a golf destination, none have come close. And while Europe and Australia have been major feeder markets for inbound Thai golf tourism for the past decade, more visiting foreign golfers already come from regional Asia – especially Japan, Korea, Taiwan, Hong Kong and Singapore – than other markets combined. As the popularity of golf increases in China and affluence grows throughout Asia, Mark Siegel says the region will remain the driving force of golf tourism to Thailand for some time to come. This was a major reason why the Tourism Authority of Thailand invited the golf writers from China, Japan and Korea – with two others from India and one from Singapore – to visit Thailand on a combined media visit designed exclusively to showcase Thai golf to Asian journalists. It was not only TAT’S first combined media visit from more than one country, but the first opportunity for most of the writers to experience Thailand’s best courses. In Bangkok, the group played at Thai Country Club near Bangkok, which for seven of the past eight years has been judged best course in Thailand, and Muang Kaew. In Hua Hin, they visited Black Mountain, which pipped Thai Country Club for top place at last year’s Asia Pacific Golf Summit, as well as Banyan Golf Club, the number three course in Thailand. 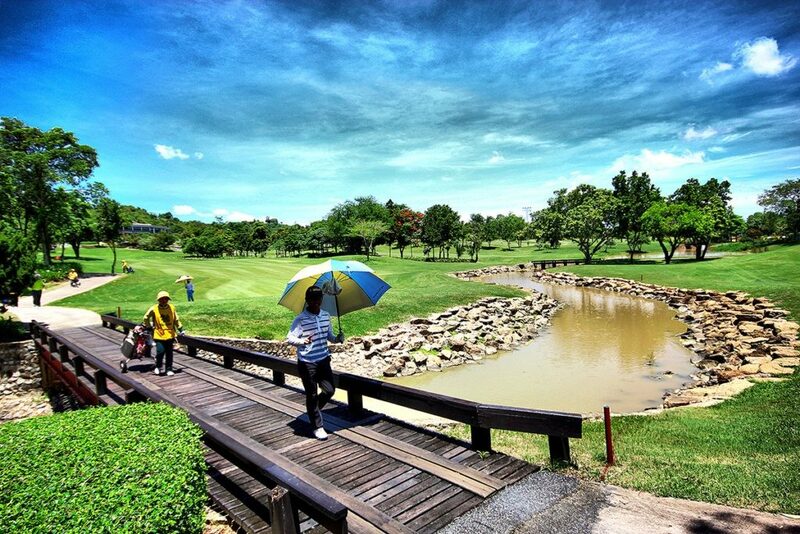 In Pattaya, Siam Country Club’s Plantation course, judged best-maintained course in the kingdom, and Laem Chabang also hosted the group. All courses are members of the co-operative marketing group, Golf In A Kingdom (www.golfinakingdom.com), which includes Thailand’s best courses, as well as top hotels and resorts around the country. The editor of Golf Digest Korea, S.K. Lee, said he was delighted to see and play the top courses – and he was impressed. “The quality is excellent and is cheaper than in Korea,” he said. Indian sports writer, Vedam Jaishanker, who covered Indian cricket tours around the world for 20 years and now writes for the Mumbai-based Daily News and Analysis from his home city of Bangalore, had only previously played golf once in Thailand and said he hadn’t realised how impressive were the leading courses. Meanwhile, the editor of Singapore-based Asian Golf Monthly, Spencer Robinson, and the editors of major golf magazines in China (including Golf Wednesday and Golf Punk) and Japan (ALBA and Golf Digest online) said they were also impressed with Thailand’s golf tourism credentials. Mark Siegel said TAT’s continued promotion of golf tourism and licensing of golf tour operators, who had to pay a bond and could be fined for poor practices, were among other reasons why Thailand would maintain its ascendancy in golf tourism in Asia. Golf course members of Golf In A Kingdom are: Banyan Resort & Golf, Hua Hin; Black Mountain Golf Club, Hua Hin; Muang Kaew Golf, Bangkok; Laem Chabang International Country Club, Pattaya; Thai Country Club, Bangkok; Siam Country Club Old Course and Plantation Course, Pattaya; Chiang Mai Highlands, Chiang Mai. Visit www.golfinakingdom.com or contact Golfasian www.golfasian.com phone +66 2 714 8470.